Star midfielder Brendan Murphy and coach Steven Poacher were also hit with 12 weeks for their part in an incident in which ref James Bermingham was confronted following the county's Allianz Division 3 defeat to Down on 16 March. Carlow lost the game to a last-minute point after an extended period of injury time and afterwards refused to speak to the media in what they regarded as the unfair treatment of smaller counties. The defeat proved pivotal in their eventual relegation to Division 4. O'Brien, Murphy and Poacher were all charged with 'Minor Physical Inference with a Referee', which the Central Hearings Committee found not proven, and 'Threatening conduct towards a Referee' which was upheld in all three cases. 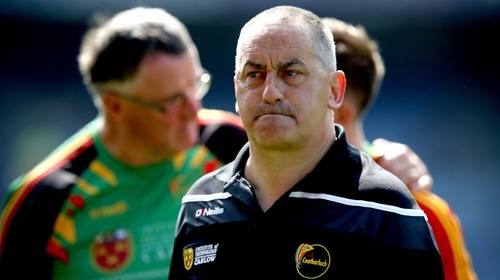 Carlow made great progess last year, reaching the Leinster semi-final for the first time in eight years and won promotion to Division 3 but the suspensions, if not appealed to the Disputes Resolution Authority, are a severe blow to their summer prospects. As is stands, the Barrowsiders would have to make the All-Ireland semi-finals for O'Brien to be eligible to take training or his place on the sideline. Murphy and Poacher could potentially return for a Leinster semi-final if it went ahead on 9 June. Carlow begin their campaign in the quarters against Meath or Offaly on 25 May. At the same meeting of the CHC, Monaghan forward Fintan Kelly escaped a ban for his sending off in the League defeat to Mayo. The committee found the alleged offence 'striking with the elbow' not proven.